Arduino is a versatile platform which is easy to program and do simple to complex tasks with the help of open source libraries. array of sensors and controls to build many great projects. all the sensors to make it easy for the user to get them going and move on to building interesting projects, Instead of having to struggle to find the right library for each sensor. learning and be a stepping stone to move on to build bigger things and solve problems. This versatile kit for the Arduino comes with 30+ sensors which can be used for carrying out a variety of experiments. 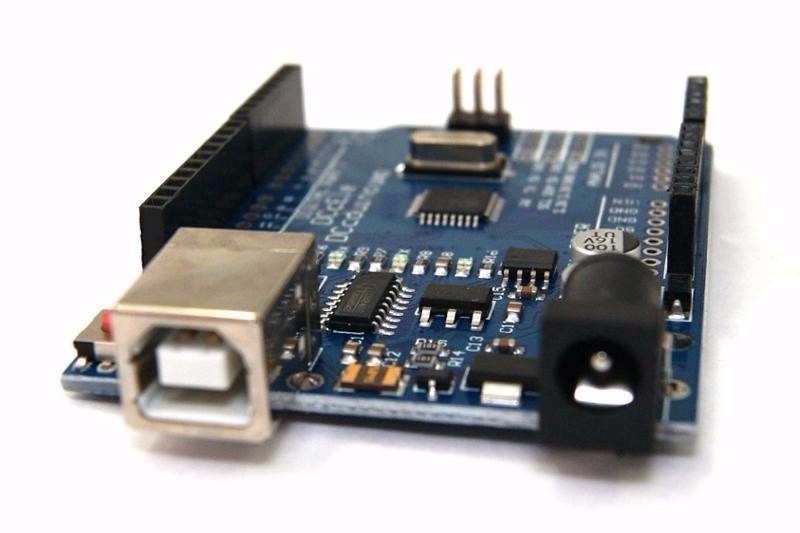 They have easy to use connectors which makes interfacing to the Arduino straight forward. The analogue joystick has two axis and 2 x 10k potentiometers with a push button action. Connector pins are described on the PCB. Included with the module is a push-on operating knob. This single relay module can be connected directly to an Arduino and requires a 5VDC supply for operation. The input is identified with an 'S'. The relay has one change over contact and can switch resistive loads up to 10A at 250VAC, and up to 10A at 30VDC maximum. Interference suppression will need to be provided. This features a high-sensitivity large format electret capsule and a potentiometer which allows adjustment of the sound level. The output D0 (active high) is switched when the sound level exceeds a preset level. The analogue output is available at pin A0. Except for the smaller size of the capsule and lower sensitivity, this module is identical to the Sensitive Microphone above. This switch is useful for avoiding obstacles or getting a model to move around the floor following a line. An obstacle in front of the sender/receive diodes will cause the output pin to be pulled low (active low). The detection range is approximately up to 1cm and a potentiometer allows the sensivity to be adjusted. Also useful for applications where obstacles need to be avoided. When an obstacle is detected by this unit the output pin becomes low (active low). This has improved distance sensitivity as it can detect objects up to around 7cm, with the sensivity adjustable through a potentiometer. An enable (EN) jumper can be installed to allow continuous operation. With the jumper absent it allows an external logic signal to be applied at the jumper to switch the detector on and off. This is active low. With a typical spectral sensitivity range of 720-1100nm at an angle of 60 degrees, this module allows flames to be detected and is optimised to detect emissions from naked flames. When a flame is detected, D0 goes high (active high). The detection threshold can be adjusted with the potentiometer. The analogue output signal is accessible via pin A0. This detects the presence of a magnetic field. When such a field is present, D0 will go high (active high). The point at which this happens depends on factors such as field strength, polarity, and the position of the magnet relative to the sensor, and the sensivity adjustment of the potentiometer. The analogue output signal is available at pin A0. Touching the sensor pin produces an output at D0 and is active high. The output includes 50Hz mains induced signals so it's not clean. The sensitivity can be adjusted with a potentiometer and the analog output signal is available at pin A0. This temperature sensor uses a NTC style thermistor. A potentiometer allows a temperature threshold to be preset that causes D0 to switch high when that temperature is reached. The analog output from the sensor is accessible at pin A0. It's all in the name really, this module is an electronic buzzer. Take care when hooking this up as 5VDC needs to be supplied on the '-' pin while ground is on the pin marked 'S'. It typically operates at a frequency of 4kHz at a minimum of 80dB and typically draws 5mA at 5VDC. This buzzer looks very similar to the passive buzzer below but can be identified as the buzzer itself is a little taller than the passive version. This buzzer, or mini loudspeaker, is slightly shorter than the buzzer above. It has 16 ohm impedence and maximum continuous current through the speaker coil is about 25mA. The outer two pins '-' and 'S' connect to the speaker and is not polarity sensitive. This clear lense colour LED uses a 150ohm series resistor and can be used on 5VDC. The '-' is the common cathode but we aware that the labelling on the PCB is incorrect. Red and Blue are actually the other way around. There's no series resistor supplied with this RGB LED, so you'll need to provide your own. A 220ohm resistor would be suitable. The '-' pin indicates a common cathode, but as before the PCB labelling is incorrect. This time however the Green and Red connections are switched. With this two colour LED, '-' represents the common cathode on the PCB. The pin marked 'R' is for the Red anode and the 'S' pin is for the Green anode. As there's no series resistor provided you'll need to provide one, around 220ohms. Like the 5mm LED above, the '-' on the PCB indicates the common cathode. The middle pin is the anode for the Red LED and the 'S' pin for the Green LED. As there's no series resistor provided you'll need to provide one, around 220ohms. In addition to a digital output on D0, this reed switch also offers an analogue output on A0. Ground can be found at the 'G' pin while '+' requires 5VDC. The potentiometer supplied is used as a pull up resistor. 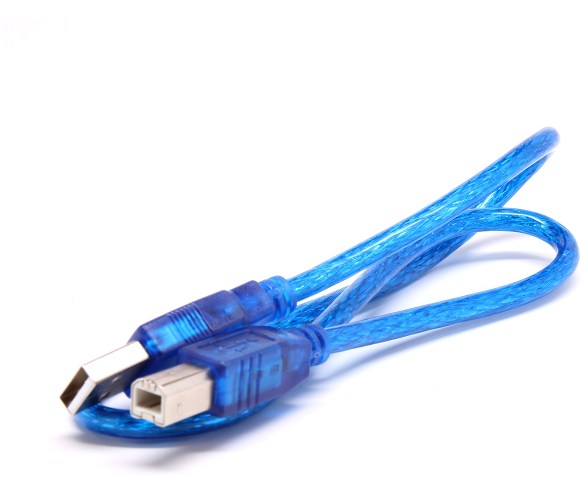 The outer two pins on the three pin male connector join up to the reed switch. It is normally open and requires a magnetic field to close the contacts. A 10k ohm resistor is onboard and is connected between the centre pin and the 'S' pin. This can be used as a pull up or pull down resistor. This neat device can be used to read a person's pulse when a fingertip is placed between the Infrared LED and the photo transistor. External circuitry is needed. 5VDC needs to be supplied to the centre pin, ground connected to the pin marked '-' and the photo transistor signal is available at the 'S' pin (this has its own pull up resistor). A 300ohm resistor for the Infrared LED is included. This clear lense LED runs directly from 5VDC and cycles automatically through a seven colour sequence. 5VDC needs to be connected to the 'S' pin and ground on the centre pin. The laser module has a wavelength of 650nm in the red colour spectrum. 5VDC can be connected directly to the 'S' pin and ground to the '-' pin. A 10k ohm resistor links the centre pin and the pin marked 'S' and this can be used as a pull down or pull up resistor. The two outer pins connect to the push button. 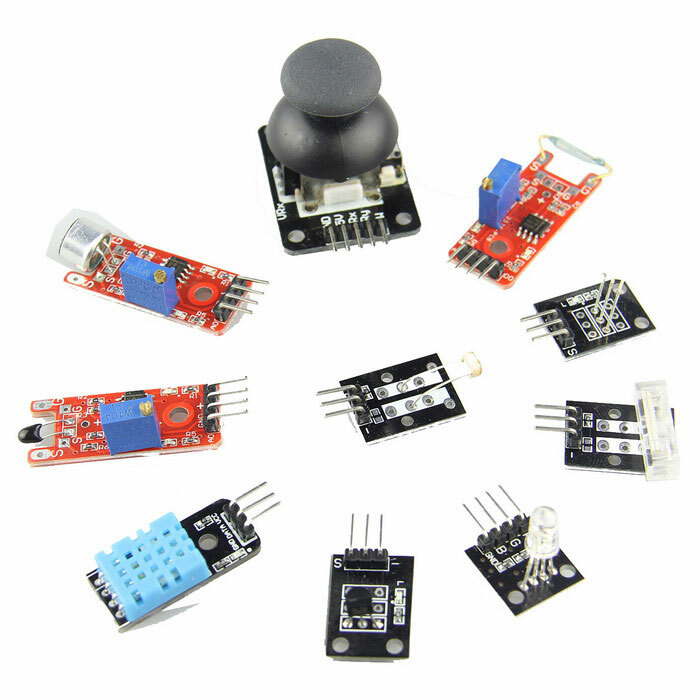 There are various button libraries available for the Arduino that can be used with this module. The switch contacts are available on the two outer pins, 'S' and '-'. A 10k ohm resistor links the centre and 'S' pins and can be used as a pull down or pull up resistor. This encoder is useful for making an electronic potentiometer. Pin indentification markings are on the PCB. Supplied as a pair, these modules feature a mercury tilt switch and transparent red LEDs. The LED cathode and one terminal of the switch is available at the 'G' pin. The other side of the switch is available at the 'S' pin, and 'L' connects to the LED anode (a series resistor is not provided so a 220 ohm resistor will need to be connected up). The '+' pin connects to a 10k ohm pull up resisitor connected to the 'S' pin of the switch. Depending on the altitude this sensor is positioned at, the mercury tilt switch will make or break a connection. Depending on your application, the built-in 10k ohm resistor connected between the middle and 'S' pins can be used for pull down or pull up use. The outer two pins are for the switch contacts which have a maximum switching load of 50mA at 12VDC. The photoresistor, also known as a Light Dependent Resistor (LDR), determines darkness when the resistance is over 20M ohm, and light at less than 80 ohms. The two outside pins are to be used. There is a 10k ohm resistor on the module between the middle and 'S' pins which simplifies the construction of a measurement bridge circuit. The popular DHT11 sensor allows reading of temperature and humidity. It can sense temperature in the 0-50 degrees celcius range (+/- 2%) and relative humidity in the 20-95% (+/- 5%). It operates on a supply voltage of 3VDC to 5.5VDC and features a built-in 10k ohm pull up resistor. For use with the Arduino DHT.h library. This module features either a 44E311, 3144EUA-S, 3144LUA-S or 49E504BG sensor and has an LED and resistor. When a magnetic field is detected the LED switches on. Ground is indicated by a '-' on the PCB, signal on the 'S' pin and 5VDC on the centre pin. A hall effect sensor module featuring an analogue output signal. The output is available on the pin indicated by 'S', ground on the pin indicated by '-' and 5VDC supply on the middle pin. The DS18B20 is a one wire digital temperature sensor with a range of -55 to +125 degrees celcius. Depending on the program, it has a resolution of 9-12 bits with an accuracy of 0.5 degrees celcius. A 4.7k ohm pull up resistor is included on the bus line. Extra sensors can be added to the bus and individually addressed. Only one pull up resistor should be connected to the bus, no matter how many sensors of this kind are used together. An NTC temperature sensor. The sensor resistance is approximately 10k ohm when at room temperature and the output can be accessed via the two outer pins. A fixed 10k ohm resistor connected between the middle and 'S' pins is included which simplifies the construction of a measurement bridge circuit. Like the DS18B20 digital sensor above, it shares the same temperature range and accuracy. If you want to create your own IR remote control then you will find this emitter useful. Ground is available at the '-' pin, 'S' is the data in while the middle pin is 5VDC supply. This sensor is the 1838 type and is for use with 38kHz IR signals. It works on a supply voltage of 2.7V to 5.5V, 37.9kHz frequency, with a typical range of 18m and a receiving angle of 90 degrees. A useful library for this is available at https://github.com/shirriff/Arduino-IRremote. This module senses vibrations. The momentary switch contacts are available at the outer two pins. A slotted light barrier. The middle pin requires +5VDC supply and ground is available at '-' with the output signal available on the remaining pin and has a 10k ohm pull up resistor connected to +5VDC.